This introduction gives a brief outline of the printing process of risography. 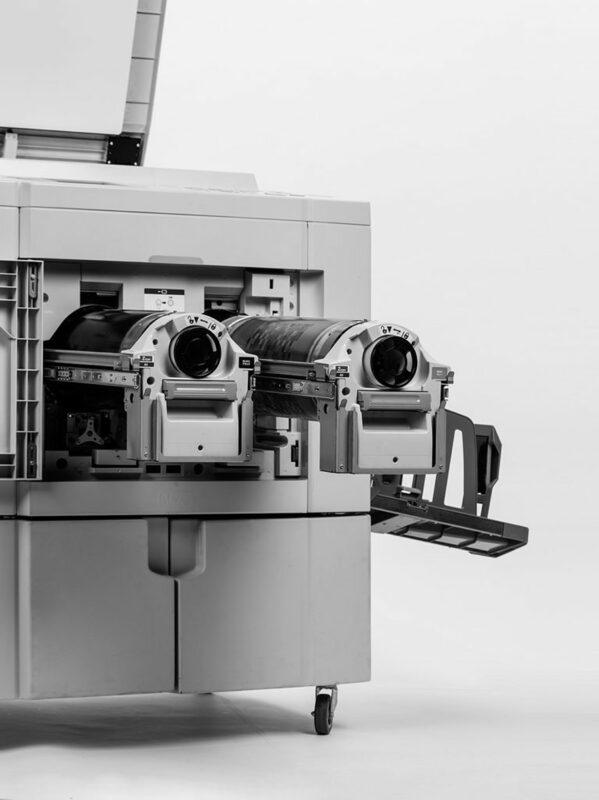 Risography is a digital duplication printing process that is designed to print short runs and is therefore environmentally friendly and energy efficient. The word Risography is a word fusion, the first syllable Riso means Ideal 1 (逤 萭 from the Japanese, n. high-end), the second syllable graphy 2 (-graph from the Greek n., graphē or graphía) means “write, draw”. Freely translated risograph is the “ideal printer”. Seen from the outside, risographs are similar to the dimensions of a photocopier or digital printer, but there are no tabletop machines for home use. A standard machine of the MZ series is 1010 × 725 × 730 sqmm 3 and weighs 168 kg. If components such as paper feed and ejection are unfolded, the printer takes up about 1600 mm in width. In order to properly operate a risograph, consumables such as inks in color cartridges and master foil is needed. Using exposed stencils, a positive copy of a template is made. Although the printing process seems to be most similar to screen printing, it is also attributable to offset printing because of its characteristic properties. But since the Risograph can also produce a unique piece of work without major expenditures, the Risography should ultimately be assigned to digital printing. At first glance, and because of the fact that a master copy is made, it is most similar to the screen-printing method, but with the advantage that a template for the risographic reproduction (a so-called master film consisting of polyester resin film on paper, which is thermographically exposed) is easier to create and faster to print. Even in industrial screen printing, some time-consuming work steps have to be followed (creating a film, coating the screen, illuminating the screen, washing it out and finally setting it up at the printing table), the trained riso enthusiast needs only 5 minutes from setting up a Print PDF until starting to print. The thermally exposed master is then fully automatically mounted on the printing drum of the risograph and wetted with ink from the cartridge located in the drum. The sheets are drawn in at very fast speeds of up to 150 pages / minute and printed positively with the image of the exposed master film in a rotary process, depending on the existing printer model in either one or two colors in one print run. While a standard laser printer prints about 100 pages in five minutes, the Risograph MZ 1070 can print up to 900 pages in the same time. In addition, the Risograph uses “real”, much more intense ink in a variety of special colors to reproduce a motif, so can print with two of over 20 standardized 4 or 50 special colors can be ordered on A4 or A3 sizes. 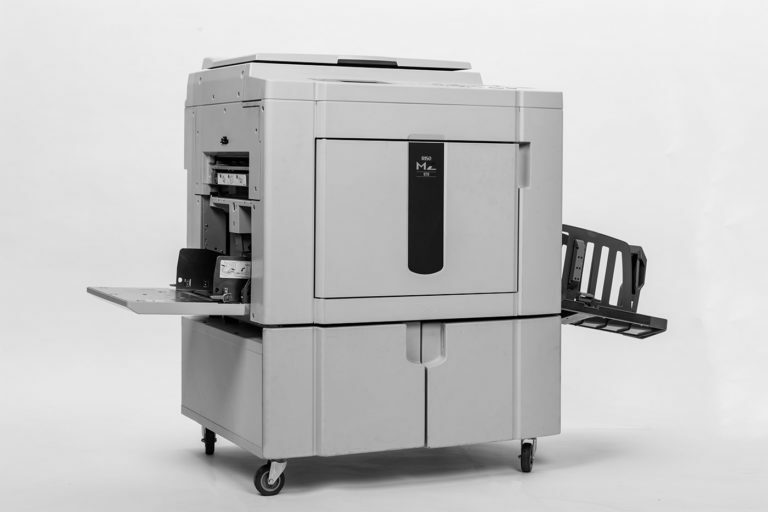 Since 2014, a riso printer with the maximum printing range of DIN A2 is also available. The prints can be made on paper up to 210g/sqm for usual machines, up to 120g/sqm for the rather “exotic” RISO A2 5. In addition to the speed of this printing process, many important factors in the process (such as screening, screen angles or colors) can be determined and influenced, allowing experimental intervention in the print run. So it is not only possible to send the print template via PDF file to the press via a USB connection. All modern risographs have the possibility to reproduce printed images through the scan pad. 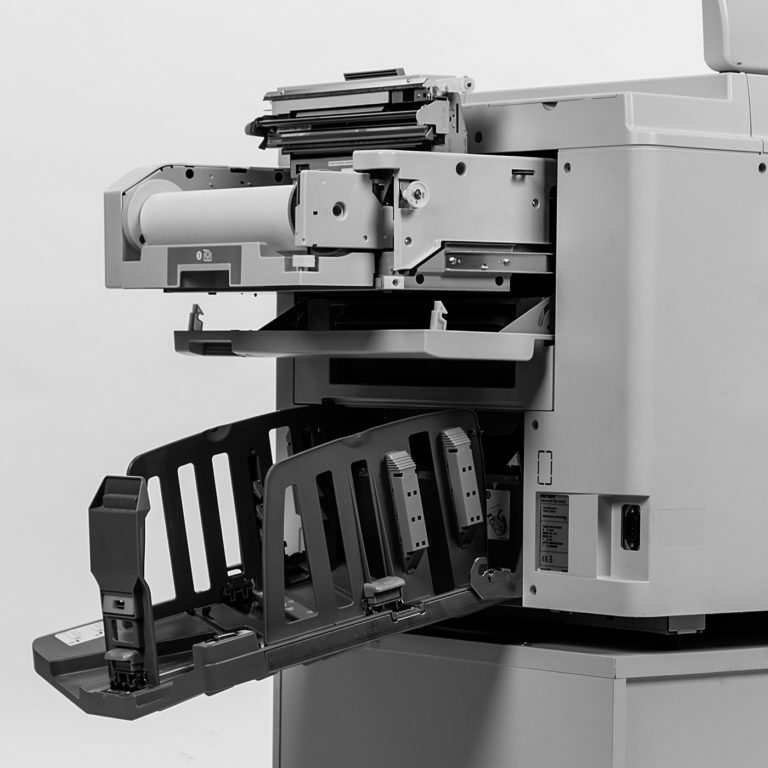 Whether a file is sent from the computer or a sketch is loaded through the scanner, actually the smooth and perfect aesthetics of a file as well as the homogeneity of digital print products are always left to develop the character of the machine. In return, the user can consciously achieve a mostly rough, sometimes filthy and above all artisanal beauty: It is rather common that there are slight registration inaccuracies between the color separations or the intake wheels rub the color over the freshly printed sheet and contribute to the appearance of a risographically printed sheet. In addition, the printer and the process offers a variety of subtleties in tuning. The individualist is thus innumerable, not fixed applications available. So far, users of risographers still belong to a small exclusive group of users, who pursue a grace of self-made. This is the surplus of this growing movement. Due to the low acquisition costs of devices, master foils and colors, it is quite understandable that artists, design studios and small publishers would like to publish themselves on the Risograph, a user base that goes beyond what was intended by the manufacturer in Japan. For the matrix printers are actually aimed primarily at schools, churches or partisan organizations. The higher humidity tolerance of 40-70% 7 also allows devices to be used in environments unsuitable for a laser printer 8, a use in climatically difficult conditions is not uncommon. However, the Risographie also has disadvantages: The colors are not fixed as in digital printing after application of the toner by heat, depending on the color application, the colors may never dry, also like the printed image, compared to an inkjet – or digital printing (with four or five colors), appear very coarse, which makes the prints for fine applications with very fine grids very unsuitable. As mentioned before, the Riso is unable to produce wholly-owned duplicates of a printed image, the printed motifs look a little different in each copy, giving the whole thing a co-existential charm between contemporary do-it-yourself look and vintage appeal, whichever by application field may mean chance and disadvantage. Unfortunately, there is a growing feeling that stencil printers like mimeographers and risographers are slowly becoming obsolete. A discussion with several dealers of Risographs for the German-speaking countries showed that the matrix machines mentioned here are replaced by newer machines after expiring framework contracts: Since 2009 the manufacturer sets his money on the ComColor standard: These machines, the multi-colored toner system of a Digital printer are similar, should therefore be given no further consideration. In the further course of this book, attention is drawn to various aspects of the procedure, assistance with the production of print templates, insight into the preparation of color separations are granted, explain the correct substrate and offer tips for printing and processing. Accompanying these texts, is an extensive, self-contained brochure that uses testprints to identify the characteristics of the printing image and color in the middle of the printed publication. The assumption that risography is a printing process that has emerged in the recent past and has been used since then is wrong. This chapter goes back to the beginnings of stencil technology and introduces the reader to inventions in Europe, America and Japan about the current state of risograph printing among artists and authors.